I am so happy to say that Finn, The Infernal Computer, has decided to play nice with my new photo software, which means I can finally include pictures again in my posts. Here is the picture of the finished First Point of Libra Shawl. It is a generous size, perfect for cozy wrapping. The Yarn I used is Miss Babbs 2-ply Yummy. The background color is Oyster. The blocks and stripes of color at the borders is also Miss Babbs 2-ply Yummy in the Gem Stone gradient. I love the yarn and I love the pattern. How can I not love a pattern that honestly says, “Don’t bind off loosely”? By the way, the pattern is well-written, a pleasure to follow. While I love the project, the shawl seems very metropolitan in feel to me. Perhaps it is the color combination I chose. 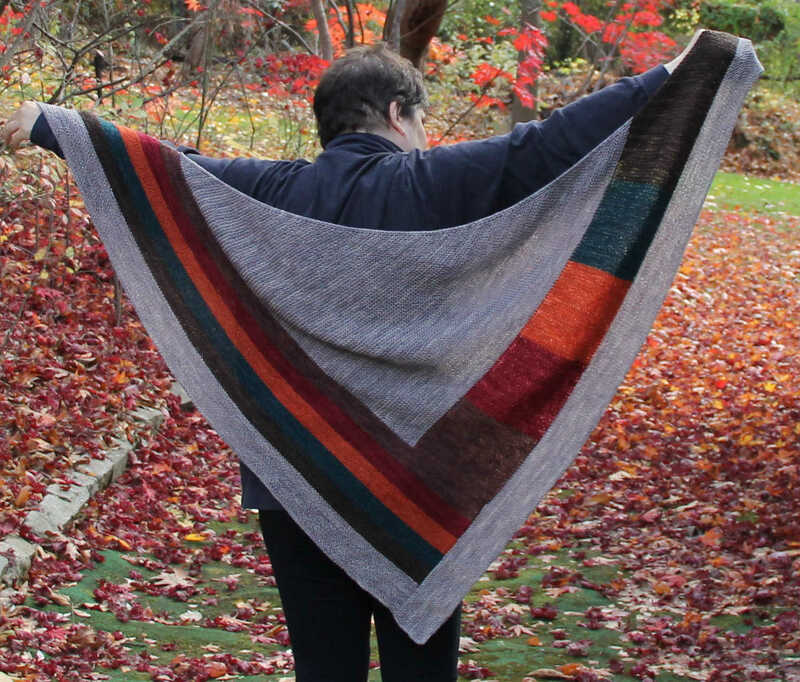 I keep seeing this shawl being paired with a well-dressed, fashion-wise woman in knee high black leather boots with high heels and a black well-fitting coat, walking down a city street. Trust me, what I just described is not the life I live. High heel boots where I live and play are just not appropriate attire. Neither is a well-fitting cloth coat. I need a storm parka that protects me even in 65 degree below zero weather. For my European friends that negative 53 degrees. So while I love it and I love the size of it, I am thinking of giving it away to the hospital charity that raises money to help fund cancer programs. The charity is based in the hospital where I received and continue to receive treatment for my breast cancer. Part of me thinks this shawl needs to be with a more upscale, fashionable woman. Not someone whose idea of dressing up is putting on a pair of clogs, rather than sneakers. Many well-heeled city women shop this particular charity store for its hand knit items. Yet I know I will miss it if I let it go. I have an appointment to see my oncologist later today at this hospital. I am taking the shawl with me to see if I can part with it. How awful will it be, if I can’t?